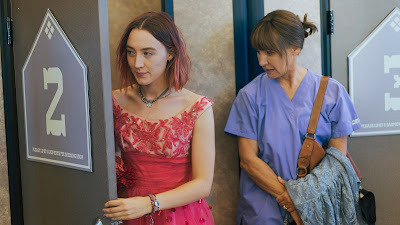 Writer-director Greta Gerwig’s Lady Bird continued to feather its nest as a dominant awards-season presence Saturday evening when it received no fewer than three awards — Best Picture, Best Screenplay and Best Director — at the 11th annual Houston Film Critics Society Awards. ACTRESS — Sally Hawkins, The Shape of Water. ACTOR — James Franco, The Disaster Artist. SUPPORTING ACTRESS — Allison Janney, I, Tonya. SUPPORTING ACTOR — Sam Rockwell, Three Billboards Outside Ebbing, Missouri. ORIGINAL SCORE — Alexander Desplat, The Shape of Water. ORIGINAL SONG — “Remember Me,” Coco. CINEMATOGRAPHY — Roger Deakins, Blade Runner 2049. FOREIGN LANGUAGE FILM — Thelma. VISUAL EFFECTS — Blade Runner 2049. MOVIE POSTER — The Shape of Water. TEXAS INDEPENDENT FILM — A Ghost Story. TEXAS INDEPENDENT FILM VISIONARY AWARD — The Secret Life of Lance Letscher, directed by Sandra Adair. HFCS HUMANITARIAN AWARD — Jim “Mattress Mac” McIngvale. OUTSTANDING CONTRIBUTION TO CINEMA — Q-Fest. By also having different kinds of movies on the web for free folks can also receive a lot of knowledge on various kinds of things.More information on yesmovies.